Let’s talk about how a dental implant replaces upper missing incisor. One of the most common cases we see in our implant clinic is broken upper central incisors. Normally there are 4 incisors for the upper and lower arch. Two central incisors and two lateral incisors. It is very common to see failed crowns with posts, failed root canal treatments on these teeth. Its assumed that these teeth are commonly traumatized as they are the prominent and usually the first to make contact against any trauma. These cases are regularly treated in our clinic with a single dental implant. Clinical case of a dental implant treatment. This patient came to see us 2 years after suffering an accident while playing cricket. The patient has no fillings and had never had any dental treatment at all apart from the regular checkups with his own dentist. When the accident happened the tooth was extensively damaged and needed to be removed soon afterwards. The general dentist was unable to provide any dental implant solutions so referred the patient to our clinic for further treatment. After the natural tooth was removed the bone healed and became much better. By the time we placed the dental implant the bone was very healthy and dense. By taking a low does CT Scan we were able to see that the implant was possible before the surgery even started. A dental implant was placed during a small minor operation carried out under local anaesthetic. When the implant was placed stability of the implant was very good hence a same day fixed tooth was made to seat on the implant. 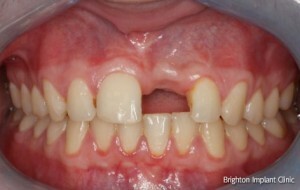 This is known as immediate loading and allows the patient to leave the clinic with a fixed tooth. No need for more dentures. Once the dental implant is placed it is common to wait between 3-6 months. During this healing time the bone actually grows onto the titanium surface and fuses with the bone. The union between a dental implant and the surrounding bone tissue is stronger than that between natural teeth and bone. A dental implant can cope well with the expected strains and stresses of natural teeth. Unlike natural teeth a dental implant will not be susceptible to dental decay. Brighton Implant Clinic is a leading dental implant clinic based in Sussex with three branches located in Brighton, Hove and Hailsham. All of the clinics have in house dental ct scanning units. The group is led by Dr Bruno Silva who has been placing dental implants since 2003.